I’m still thinking about my Trifexis versus Sentinel dilemma. And here’s where I think best. Aaaahhhh…..in the big bed. Snoozing like a peep. And why not? I’m almost human, yes? Thanks for all the suggestions, feedback and comments about my monthly med. I’ll let you know what We decide. 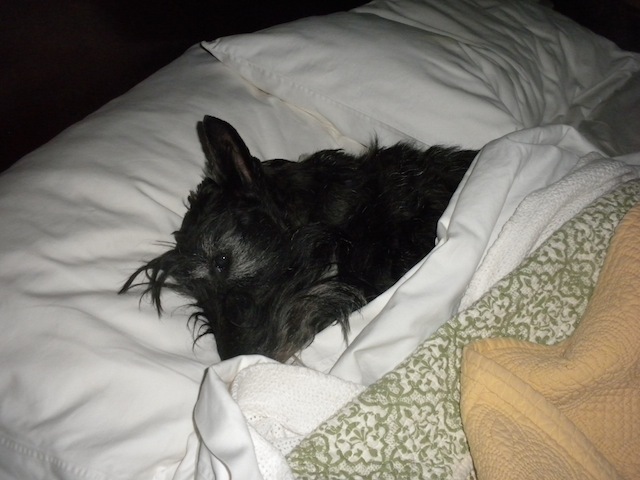 This entry was posted in Scottie health, Scotties, Scottish Terriers, Terriers, The Scottie Chronicles and tagged dog health, dogs, pets, Sentinel, Trifexis. Bookmark the permalink. Thinkin are a dangerous pasttime. Good idea, Stuart. Everyone should always give a lot of thought to important decisions! Get a coin. Make it easy on yourself. You should check the internet. You always get reliable, honest and factual information from the internet. How do you keep those white sheets so clean? You look so wise and thoughtful in that pose. We wish you well with your decision. Those things are never easy. You have wise Peeps who will make the right decision along with you. If you haven’t had a problem, why change? Lee says I am taking Trifexis ~ why because I still have a six month supply. Sentinel prevents flea egg development and ends the flea life cycle, but doesn’t kill adult fleas; Trifexis kills fleas period (it has been proven to kill 100% of all biting fleas within four hours). They both can have side effects so it is a toss up. Lee’s Grandmother’s dog lived into his 19th year. Only got rabies and distemper shots. Farm Bureau dog food with milk straight from the cow and table scraps. Each dog Lee has had seems to have gotten more shots and fancier dog food and has lived shorter lives. DOES THIS NOT SAY SOMETHING!!!!!!!!! I thinks we takes Iverhart… but we don’t gots a flea problem round here, luckily. we are on the side of Sentinel – we have been using that for the last two years.